Black Hills Hiking offers a wide diversity of opportunities. There are more than 75 trails with over 450 miles of hiking throughout the Black Hills. 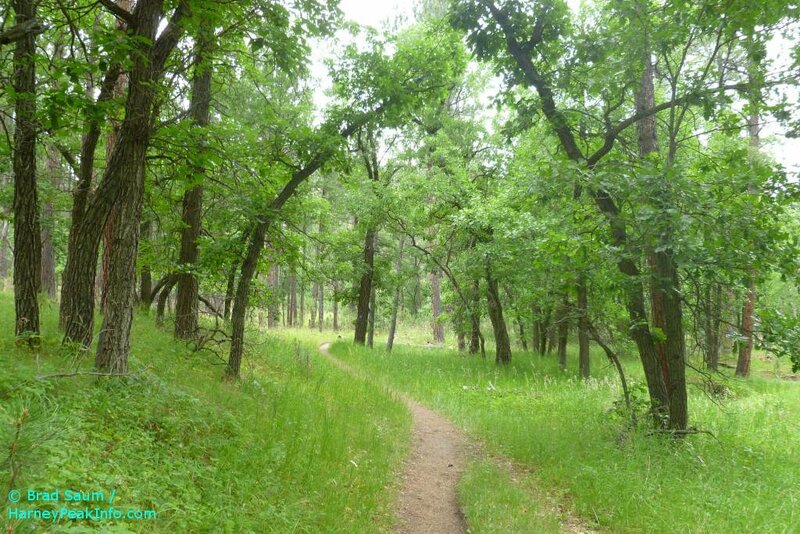 Black Hills hiking includes the open prairie, shaded forests and steep inclines. Harney Peak is typically hiked from the Sylvan Lake trailhead and climaxes at the 7,242 summit, the highest point in the Black Hills. The gently sloping 109-mile George S. Mickelson Trail, and the 111-mile Centennial Trail are two of the longest trails. Each of these have many trailheads and can be hiked in varying lengths. Custer State Park offers some great Black Hills hiking experiences. Lover’s Leap Trail and Grace Coolidge Walk-In Fishing Area are two hikes that demonstrate the diversity of Black Hills hiking. Lover’s Leap Trail is difficult with a steep incline to the scenic overlooks and the Grace Coolidge Walk-In Fishing Area is an easy stroll along the creek. 1. Drinking Water: Carry your own drinking water. Water is not available along the trails. 2. Proper Footwear: Some trails are difficult and all trails have some obstacles, such as rocks and fallen trees; therefore good solid footwear is helpful. 3. Camping: Only allowed in designated campgrounds. 4. Fires: Open fires are allowed only in designated picnic areas and campgrounds in approved fire grates, and then are dependent on local fire danger conditions. 6. Weather: Afternoon thunderstorms are common in the summer months. 7. Leave a message: Make sure someone knows about the trails you will be hiking/biking, with an estimated time of your return. 8. Poison ivy: Often found along trails, especially near streams. Learn to identify it and wear pants when hiking. 9. Do not feed the wildlife. 10. Bison: Custer State Park is home to a large bison herd. Please keep your distance. 11. Rattlesnakes: Found in Custer State Park. Rattlesnakes will strike if threatened. If bitten, seek medical attention immediately. 12. Mountain lions: Many live in the Black Hills. Be alert for wildlife at all times. If you encounter a mountain lion up close – DO NOT RUN, maintain eye contact with the lion, talk and yell at it, gather children close to you, make yourself appear as large as possible and become aggressive by throwing objects or waving sticks. 13. Ticks: Tiny insects found in thick vegetation. Ticks can spread Rocky Mountain spotted fever, Lyme disease and other illnesses. Use care when removing ticks.